Need quick and easy long lasting UVA/UVB protection with a high SPF factor? 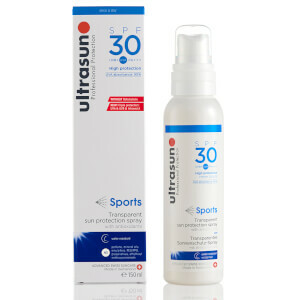 Ultrasun Clear Spray SPF 30 Sports Formula could be just what you’re looking for. The Ultrasun Clear Spray SPF30 Sports Formula benefits from the spray bottle design making it easy to apply even when you only have one hand to spare. This combined with the light weight non-greasy liquid formula makes it perfect for even the most energetic watersports and outdoor adventures. It is also perfect for those with delicate skins as it does not contain any nasty oils, emulsifiers or perfume. This cleverly reduces the risk of allergy and makes it great to use on sensitive areas like the scalp where there is perhaps a little less hair then there used to be. Alcohol, Phenoxyethyl Caprylate, C12-15 Alkyl Benzoate, Octyldodecanol, Diethylamino Hydroxybenzoyl Hexyl Benzoate, Ethylhexyl Salicylate, Diisopropyl Adipate, Ethylhexyl Triazone, Bis-Ethylhexyloxyphenol Methoxyphenyl Triazine, Dibutyl Adipate, Aqua, Alcohol Denat., VA/Butyl Maleate/Isobornyl Acrylate Copolymer, Vitis Vinifera Seed Extract, Glycerin, Tocopheryl Acetate, 2,6-Dimethyl-7-octen-2-ol, Lecithin, Caprylic/Capric Triglyceride, Ascorbyl Tetraisopalmitate, Tocopherol, Ubiquinone.